History of Russian higher educations dated back way to the 19th century. During the Russian enlightenment era, many universities were founded. Earliest universities in Russia were situated mainly in major cities, such as Moscow and St. Petersburg. Several institutions were also founded in the Siberian part of Russia. These universities were the pillar of science and education of Russia, and continue to be so until present days. On this list, there are 10 oldest universities in Russia. At present, the university hosts millions of students from Russia and all over the world. Russian universities are open for international students. And there are many scholarships both from the government and the private institutions. Majors and programmes are varied, with the most popular ones can be checked here. Saint Petersburg State University is number one of the 10 oldest universities in Russia. It is founded by a decree of Peter The Great, the emperor of Russia. The university put a foundation on Russian education since its establishment. Since the 19th century, it has been a center of research in mathematics, science, literature and humanities fields. Today the university is one of the leading research universities in Russia. SPBU has 30,000 students with 6000 academic staffs. The university ranks second in Russia after Moscow State University, and it ranks 240th in the world. Leading programme on SPBU includes mathematics, linguistics, history, and physic & astronomy. Interesting fact, notable alumni from this university are including Vladimir Putin and Prime minister of Russia Dmitry Medvedev. The most prestigious and ranks number 1 in Russia, Lomonosov Moscow State University (LMSU) was founded in 1755. Its founder was Mikhail Lomonosov, a Russian scientist, and polymath. LMSU has 39 faculties, where 47,000 of its students study. The campuses located mainly in downtown Moscow, with its main building which is the tallest campus building in the world. Also known as Imperial Academy of Arts, the institution was built in 1757 by Ivan Shuvalov. 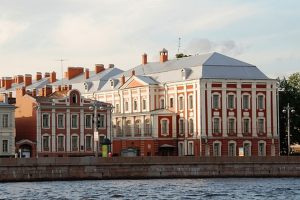 St. Petersburg Art Academy occupies a historic neoclassical building on the bank of Neva River. The university is among the most difficult institution to get into in Russia. Every year, only 1000 students were accepted in this art academy. Established in 1738, Vaganova Academy is where the future Ballet dancers train and study. The academy has a fundamental role in shaping today’s modern Russian ballet. It was originally named Imperial Ballet School by the decree of Empress Anna. But in 1957, the name was changed into Vaganova Academy, in honor of Agrippina Vaganova, an important figure of ballet training in Russia. The academy has educated many notable prima Ballerina throughout the years. It has an official cooperation with Mariinsky ballet, the most prominent ballet company in Russia. After completing the 8 years education, students will perform a final gala at Mariinsky theater. The best students will be hired by Mariinsky company while the rest will join various world-class ballet companies across the world. First Moscow State Medical University (MSMU) as a faculty of Moscow State University. It was not until 1930 that the university became a separate entity by itself. As indicated by its name, the university is a higher institution focusing on medical studies. MSMU is the oldest medical school in Russia. Kazan Federal University is located in Kazan, Republic of Tartarstan. It was founded by a decree of Emperor Alexander I. It used to be the easternmost university in Russia. In the beginning, the university has only four departments: Moral & Political Sciences, Mathematics, Medical science, and philology. Kazan University is credited with many discoveries throughout history. Among those discoveries are Nikolai Lobachevsky’s Non-Euclidean geometry and Karl Klauss discovery of chemical element Ruthenium. Famous writer Leo Tolstoy is also an alumni of this institution. Founder of Soviet Union, Vladimir Lenin, studied briefly at Kazan University. The oldest technical university in Russia, BMSTU history goes way back to the year of 1763. This year is when Empress Catherine II founded the Educational Imperial House, an orphanage for stray and unwanted children. But it was not until 1826 when Dowager Empress Maria instructed a workshop and school where the orphans study. The university was the first one to implement applied science with real-life application needed by developing Russia during the time. Bauman University today is the most prestigious technical university in Russia. It has 19 departments, from science to engineering. The university provides cutting edges research in various technical fields, and maintain close cooperation with many companies and industries. Bauman graduates are highly sought after by companies in Russia. Tomsk State University is the first and the oldest university located in the Siberian part of Russia. It is located in the city of Tomsk and founded in 1878 by a decree of Emperor Alexander II. It has only one faculty at the beginning, the medical faculty. Now the faculties expand into 23 faculties with 151 departments. The library at Tomsk University is famous for its comprehensive collection. The library hosts 3,8 million items. There are 124,000 manuscripts and rare books in the library. The library is founded at the same year as the university opened, in 1888. The university is the first university in Europe focusing on electrical engineering. Early in the 19th century, there was a new demand in Russian Industries especially regarding electrotechnical. It was built in 1886 as a technical university, but later focused on electrotechnical and changed the name into Technical College as Electrotechnical Institute (ETI). As of today, the university’s official name is Saint Petersburg Electrotechnical University (ETU). ETU has around 8000 students, currently studying on its 10 faculties. Far Eastern Federal University, the last in our 10 oldest universities in Russia list, is located in Vladivostok, Russia. The university was founded in 1899 as a center of education for oriental studies. It was originally an institution to train students with matters regarding relation, management, and commercial and industrial with the far east. As of today, the university has 40,000 students enrolled with around 2000 of them are international students.